Have you ever wanted to get your webmail on your desktop? 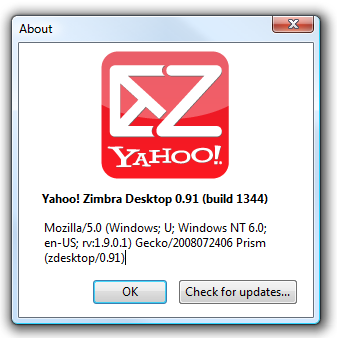 Yahoo’s Zimba Desktop does just that, and a lot more with web-based access to your Gmail, Yahoo or even Exchange mail… but as desktop application that even works offline. Confused? Keep reading. 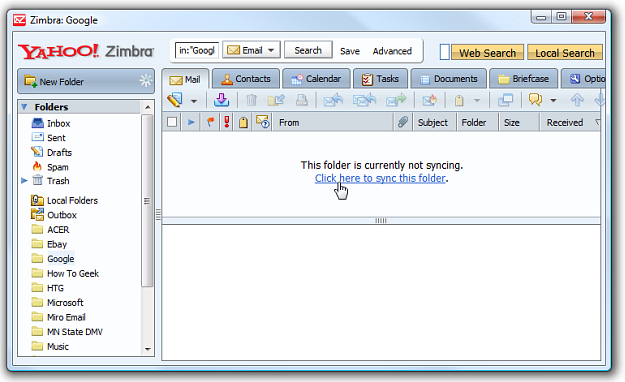 Today we will look at the Zimbra desktop email client and see how well it works. I am running the Beta Version .91 (build 1344) on Vista Ultimate (64-bit). Did I mention there is a version for Linux and Mac as well? After installing Zimbra you are greeted with an easy to follow Wizard to help get everything set up. 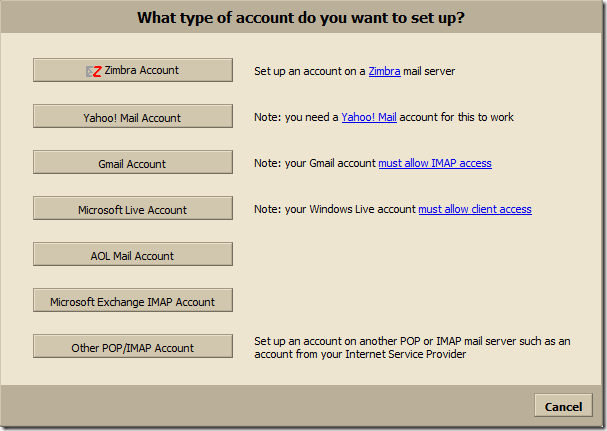 Not only does Zimbra offer to get your Yahoo mail but also a wide range of other services including your ISP. Note that you will need to set up Gmail to allow IMAP access. 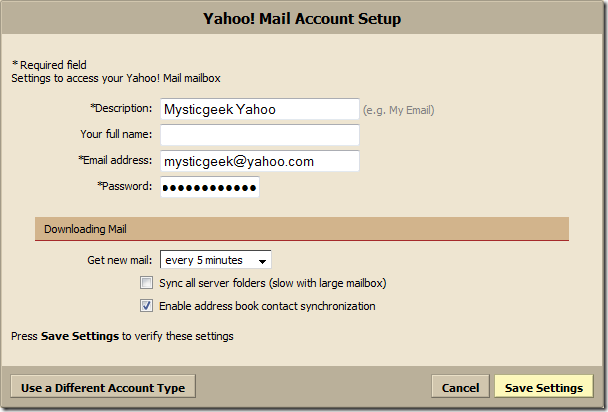 For this post we will take a look at adding a Yahoo email account. Setup is quite simple, just pop in a name for the account, email address, and password. Another cool feature to point out is synching your Yahoo address book. After saving my settings it took a moment for the application to launch and already had most of my contacts and existing folders. For larger mailboxes it takes longer to sync everything up. I also noticed that I had to sync each folder individually. The user interface looks a lot like the Yahoo Mail web interface. 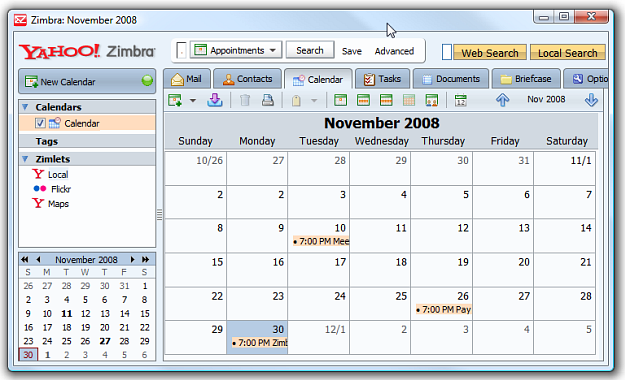 There are some nice features included with Yahoo Zimbra, as you would expect from any email client there is a handy calendar which you can sync up. 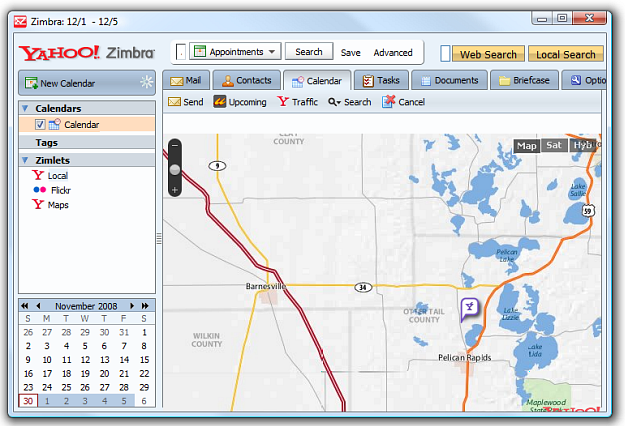 There are utilities included called “Zimlets” that allow you to use Yahoo Local, Flickr, and Maps. Here is an example of Maps. A lot of different options for choosing the way you would like Zimbra to look and act. Similar to other clients there are pop up reminders for scheduled affairs. From what I have played with so far this is a pretty cool email client. Not everything is web based but a lot of it is so you will have to deal with some delay time while connections are made. I did not experience anything painfully slow in this beta version. This is definitely fun and easy to use and I seem to prefer this user interface to Windows Live Mail. Remember it is a beta at this time, but if you’re looking for another alternative to Outlook, Zimbra might be a possibility. The best part for me is being able to easily check my Yahoo mail along with other accounts.